Well, the "maybe" I postulated a few weeks back has become a "definitely". In fact, an almost-finished-draft "definitely". My main goals with this revised edition are firstly to reformat the book as A5 (my preferred format nowadays) and secondly to improve the thematic consistency and usability of the content. One thing in particular that I wanted to improve over the original edition of Theorems & Thaumaturgy were the guidelines for integrating all the new spells and classes into campaigns. To that end, I've written several pages of ideas and optional rules which will, hopefully, really help clarify the different approaches which are possible and their pros and cons. This is a book, primarily, full of spells. Hopefully, after having a browse, you'll feel inspired to start using all this new material in your campaign, but how to go about this? That depends primarily on whether you're starting a new campaign or already running one. Below are some guidelines for each of those situations. Introduce one or more of the new classes (elementalist, necromancer, vivimancer) as members of a school of wizardry from a region which the players haven't explored. These wizards may be directly encountered by the player characters (as friendly, neutral, or antagonistic NPCs) or may be spoken of in rumours or adventure hooks. Once the new classes are known to exist in the setting, they become available as an option for any future player characters that are created. An alternative way to use this book is simply as a resource for new spells. If you want to follow this approach, simply ignore the classes and their spell lists and make all of the new spells available for use by standard magic-users (or druids, clerics, illusionists – as you wish). New spells can easily be introduced by putting scrolls or spell books in the hands of player characters: as gifts from mentors, as rewards for missions accomplished, or discovered in the treasure hoards of defeated enemies. The new classes in this book may simply be added to the roster of choices available to players when creating their characters at the start of the campaign. When preparing for a campaign, it is also worth considering that an excellent way of imparting a specific and novel flavour to the milieu is to alter or restrict the classes of adventurer which exist (and thus the classes from which the players may choose when creating their characters). A very interesting potential, then, is to imagine a world where standard spell-casting classes do not exist, being replaced by one or more of the classes from this book. A world where vivimancers are the only type of arcane practitioner, for example, takes on a very different tone and has very different possibilities than a world dominated by the standard fireball-slinging mage. 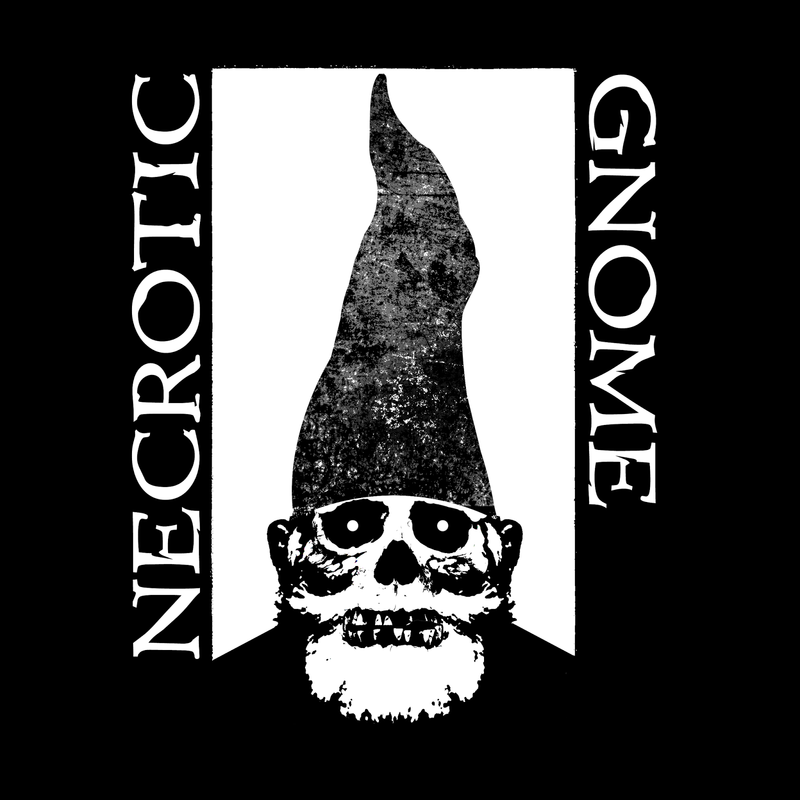 Or, perhaps, the wizards of a certain kingdom may all be known to be necromancers, while the neighbouring land only allows the practice of imperially sanctioned elemental magic. This kind of approach can really breathe new life into the game. Each of these three new classes is presented in its own section. However, no mechanical details (e.g. saving throw or to-hit charts, prime requisites, lists of allowed armaments, etc.) are specified. It is assumed that these classes perform and advance in exactly the same manner as the standard magic-user class, with the one (albeit major) difference being the replaced spell list. In the spell lists for the new classes, the symbols (C), (D), (I), and (MU) are used to denote spells drawn from the standard cleric, druid, illusionist, and magic-user lists, respectively. The basic Labyrinth Lord rules describe a single type of arcane magic, usable by magic-users and elves. The Advanced Edition Companion and other books, such as this, add further, more specialised wizardly classes: illusionists, elementalists, necromancers, etc. In campaigns with multiple different types of arcane spell-caster (i.e. wizards), it pays to give some thought to how they inter-relate, both in terms of their place in the society of the imagined world and in terms of how the classes interact with each other on a mechanical level. This section discusses some issues around the latter point; the society of your campaign world is in your hands alone! It is important that the Labyrinth Lord consider to what degree characters of the different wizardly classes are able to use spells from the other spell lists. Traditionally, in Advanced era games, the two types of arcane spell-caster – illusionists and magic-users – practised entirely different kinds of magic and, apart from a few areas of overlap, were unable to cast spells from each other's list. Characters of each of the classes presented in this book are designed to be competent adventurers in their own right, with a different balance of strengths and weaknesses when compared to classical magic-users. They are able to stand on their own and do not require access the standard magic-user spell list. Some Labyrinth Lords may, however, prefer there to be less strict boundaries between the different types of wizard, with some possibility of casting spells from each other's spell lists. If this is allowed, it will clearly increase the power of each class to a significant degree, as they will gain access to a broader selection of spells and types of magic. Some possible approaches in this direction, listed in ascending order of permissiveness, are described below. Whatever is decided, this should always be a two-way decision – standard magic-users must be treated in the same manner as all other types of wizard. Fallible scroll-use: All types of wizard may cast scrolls of spells from other spells lists (for example, a magic-user may cast an illusionist scroll). They are unable to learn these “foreign” spells but have sufficient arcane knowledge to be able to activate magic encoded on scrolls. When casting such “off-list” spells from scrolls, there is a 10% chance of failure per level of the spell being cast. Failure indicates that the scroll is wasted or (if the Labyrinth Lord wishes) causes some kind of backfire. In this way, low-level spells may be cast fairly reliably but high-level spells will remain the sole province of the appropriate specialist. Reliable scroll-use: Off-list scrolls may be cast without risk of failure. This allows the boundaries between the different types of specialist wizard to be blurred slightly, but only in the (presumably somewhat special) situation when magical scrolls are acquired as treasure. Limited learning: In addition to allowing foreign spells to be cast from scrolls (either with or without a risk of failure), another possibility is to allow wizards to also learn a smattering of them – one per level of spells which can be cast. (For example, a 7th level wizard may cast spells of up to 4th level. Using these rules, she could thus learn four spells from specialist areas not covered by her standard spell list.) This system allows wizards to diversify their spell repertoire and have a few tricks up their sleeve, while maintaining the clear separation between the different types of specialist. Reduced chance to learn: This is an option for games where the advanced “chance to learn spell” rules are used. Wizards may cast foreign spells from scrolls (as above, with or without a risk of failure) and may also attempt to learn an unlimited number of off-list spells, but with a reduced chance of success. A penalty (-25%, for example) is applied to the chance to learn foreign spells. The Labyrinth Lord may also stipulate the additional requirement of a period of research (one week per spell level, perhaps at a cost of 250gp per week). Under this system, it is likely that wizards will end up having a significant number of off-list spells in their spell books, as their careers progress. This is the most flexible system before the boundaries between different wizardly classes are collapsed completely. It is assumed that all classes of wizard acquire new spells in the same means as the standard magic-user: by finding spell books or scrolls in treasure hoards. Ideally, then, the number of spells discovered which can be cast by each type of wizard should be (roughly) balanced. When it is determined that a treasure hoard contains scrolls of magic-user spells, it is desirable that spells usable by specialist wizards also be (at least some of the time) present. One way of handling this is to multiply the number of spells present in the hoard (as indicated by the treasure tables) by the total number of wizardly classes in the campaign, then to give each spell an equal (random) chance of being taken from the list of each class. For example, in a campaign with magic-users, elementalists, and illusionists, the number of spells found in a hoard would be multiplied by three and each spell would have a 1 in 3 chance of being taken from the standard magic-user list, a 1 in 3 chance of coming from the illusionist list, and a 1 in 3 chance of being from the elementalist list. The Labyrinth Lord ensures, in this way, that the balance of spells available to characters of different spell-using classes remains fair and consistent. Note that, as some spells are shared between the different classes, these guidelines will, in fact, slightly increase the number of spells available. It is also worth bearing in mind that, even if an adventuring party discover scrolls of spells that they cannot cast themselves, such scrolls still have value and may be sold to or bartered with NPCs who can put them to use. 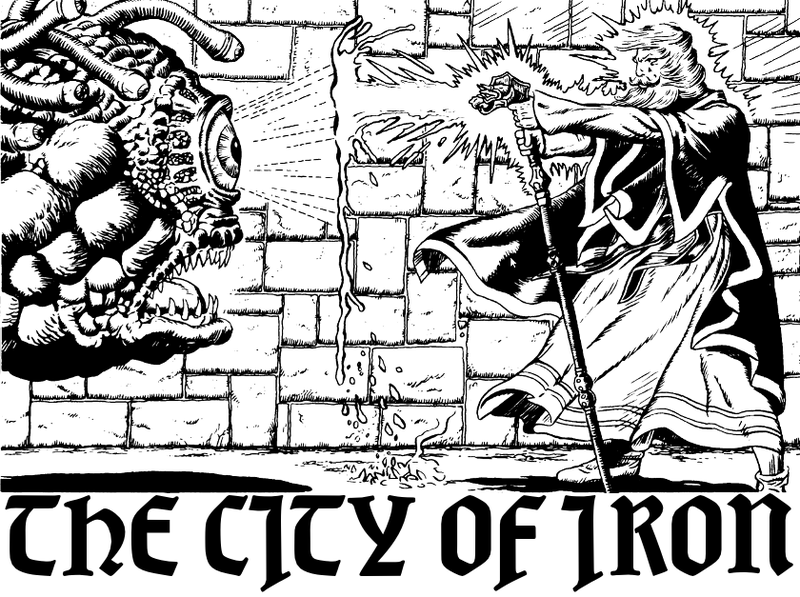 This section contains optional guidelines for Labyrinth Lords on the subject of how wizardly characters may gain access to and learn new spells. Wizards begin the game knowing read magic, one randomly selected spell from the appropriate class spell list, and one spell of the player's choice. The number of spells a wizard can know (i.e. record in his spell book) is limited to no more than double the number that he can memorize. For example, a 5th level magic-user can memorize two 1st level, two 2nd level, and one 3rd level spell. Such a character could have at most four 1st level, four 2nd level, and two 3rd level spells in his spell book. Upon gaining an experience level, if the wizard does not already have spells available to learn (e.g. from scrolls or captured spell books), he automatically acquires knowledge of one new spell, selected randomly from a level of the player's choosing. Design Note: In the original Basic rules, magic-users and elves were limited to knowing one single spell at 1st level – not even read magic was “free”! – and could never record more spells in their spell books than the number they could memorize each day. Personally, while I find this system charming in its simplicity, I feel it is too restrictive and use the system described above in my own games. Other groups may, however, prefer to stick with the original rules. Wizards begin the game knowing read magic, two randomly selected spells from the appropriate class spell list, and two spells of the player's choice. The number of spells a wizard can know (i.e. record in his spell book) is limited by the character's INT (see the AEC). Upon gaining an experience level, if the wizard does not already have spells available to learn (e.g. from scrolls or captured spell books), he automatically acquires knowledge of one new spell, selected randomly from a level of the player's choosing. This spell must be learnt according to the normal rules for spell learning, again dependent on the character's INT. In my previous post about the Rogue class and its various sub-classes, I didn't go into any detail as to what spells exactly are usable by the magic-using sub-classes, the bard and the arcane trickster. Here's the list of songs available to bards. I'm keeping things limited to the spells that are available in the LL Advanced Edition Companion, initially. Bard songs take one turn to have magical effect. Bards do not need to memorise songs -- they can play any magical song they know at any time, subject to the limited number of songs per level per day. Bard songs which produce an effect with a duration need not be physically played or sung for longer than the one turn casting time. Once the spell takes effect, the bard may stop playing. The song instead lingers in the bard's mind until its duration expires. During this time, if the bard plays any other magical song, the maintained spell is cancelled. Songs with permanent duration do not have this requirement. Songs which have the effect of enchanting another person must be audible to the target in order for the magic to take hold. Proficiencies: all armour, shields, simple weapons, martial weapons, 2 of: Acrobatics, Awareness, Climbing, Survival, Swimming. Archery: +1 to attacks with missile weapons. Defence: +1 AC bonus when wearing armour. Duelling: +1 to attacks and damage rolls when wielding only a one-handed melee weapon. Protection: When wielding a shield, you can grant a +2 AC bonus to a single character within 5' of you. Warrior Archetype: Choose an archetype. Extra Attack: You can make two attack rolls on your turn. Extra Attack: You can make three attack rolls on your turn. Extra Attack: You can make four attack rolls on your turn. Improved Critical: An attack roll of 19 or 20 is a critical hit. Indomitable: Once per day, you can re-roll a failed saving throw. Fighting Style: Choose a second fighting style. Spell-Casting: Limited spell list. Slow progression, up to 4th level spells. Number of spells known is strictly limited. Weapon Bond: With a one hour ritual, you can bond up to two weapons to yourself. A bonded weapon can be summoned instantly to your hand from anywhere on the same plane of existence. War Magic: You can make a single attack and cast a spell in the same round. Favoured Enemy: Choose a monster type (dragons, goblinoids, giants, animals, etc) or a profession (cultists, witches, outlaws, etc). You gain a +1 bonus to Search checks to track or Lore checks to recall knowledge about your chosen enemy. Extra Proficiencies: Gain proficiency with Awareness and Stealth. Second Favoured Enemy: Choose another type of favoured enemy. Expert Slayer: Gain +1 to hit and damage against your favoured enemies. Gain a +2 bonus to saving throws and AC against their attacks. Animal Companion: A normal animal becomes your faithful companion. You may purchase the animal or find it in the wild. In combat, you can give the animal verbal commands. If your companion dies, you may find another beast to replace it after a week. Extra Proficiencies: Gain proficiency with Awareness and Nature. Bestial Fury: Your animal companion may make one extra attack each round. I'm planning a berserker warrior sub-class, but haven't come up with any mechanics that I like yet. I'm not that keen on the 5e barbarian berserker, with the "resource management rage" mechanic. I don't see berserk fury as something that has to be scrupulously managed. If anyone has any ideas for a berserker sub-class that'd fit with the system above, please suggest! Yeah... I don't believe in paladins. I've never really understood how they're different from clerics. On a whim, I just knocked up a PDF of 5e spells by school. The lists include spells from all classes mixed into one, which may be of use to someone (it's probably going to be useful for me). It includes all the spells from the PHB and the Elemental Evil Companion. Now that we have a skill system, I'll present the rough outline for a class: the rogue. Yes, I'm calling it "rogue" not "thief". There's a good reason for that: one of the things I love about the 5e rules is the way that each class has several different "archetypes" -- essentially sub-classes -- which players can choose between. In the case of the rogue class, one of those archetypes is the thief. Weapons: non-proficient attacks incur a -4 penalty to hit. Armour: wearing armour with which the character is not proficient incurs some penalty that I've not fully considered yet. You definitely can't cast spells, at least. Tools: work like skills. 1 in 6 base chance of success, modified by ability score and proficiency bonus. I like the D&D 5 list of tools, so would go with that. Proficiencies: light armour, simple weapons, hand crossbow, longsword, rapier, shortsword, thieves' tools, 4 of: Acrobatics, Arcana, Awareness, Climbing, Lore, Performance, Search, Sleight of hand, Stealth. Expertise: Gain a +1 bonus using 2 skills (or your proficiency with thieves' tools) of your choice. Thieves' Cant: Speak the secret code language of thieves. Rogue Archetype: Choose an archetype. Expertise: Choose 2 more skills to gain a +1 bonus. Read Languages: Make a Lore check to understand the broad gist of any text. Use scrolls: Make an Arcana check to use magic-user scrolls. Extra Proficiencies: Gain proficiency with disguise and poisoner's kits. Infiltration: Pretty much as described in the 5e rules. The ability to create a false identity and to mimic someone's behaviour and voice. Spell-Casting: Limited spell list. Slow progression, up to 4th level spells. Number of spells known is strictly limited. Initially: unseen servant and one other. Legerdemain: Use thieves' tools or Sleight of hand via unseen servant. Magical Ambush: Targets who are unaware of your presence suffer a -4 penalty on saves against your spells. Magical Songs: Limited spell list. Slow progression, up to 4th level spells. Number of spells known is strictly limited. Spells require a Performance check and one turn. Dodge: You can dodge out of reach of enemies, making a fighting retreat at full speed. Tumbling Attack: Make an Acrobatics check to move towards an enemy, make a melee attack, then leap out of reach (effectively a fighting retreat) all in one round. Evasion: For effects which allow a save for half damage, a save indicates that you take no damage. You suffer half damage on a failed save. Slow Fall: Subtract your level from falling damage. Uncanny Dodge: When damaged by an attacker that you can see, make an Acrobatics check to reduce the damage by half. As I mentioned on Google+, I've been thinking about how it might look to take some of the bits I like about D&D 5 into a simpler rules system like Labyrinth Lord. One of my favourite bits of the new edition is the simple skills / proficiency system. This forms a foundation for some other stuff, so I'll lay that out first. 1d6 based, like LotFP. All characters have a base 1 in 6 chance of success. Relevant ability score above 14: +1 in 6 chance of success. Relevant ability score below 7: -1 in 6 chance of success. Proficient: +1 at 1st level, +2 at 5th level, +3 at 10th level, +4 at 15th level. Difficulty: easy tasks may increase, difficult tasks reduce the chance of success (as the referee wishes). I've never been a fan of the d20 system, so in considering a skill system suitable for bolting onto Labyrinth Lord, I knew immediately that I'd be looking for something else. 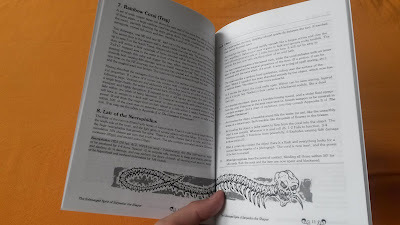 I went for a d6 based skill system for several reasons: its precedent in the basic rules in the form of rolls to hear noises or find secret doors, surprise, etc; its use in LotFP, which I'm familiar with and have always admired. You could bolt on another system easily enough; you just need to make sure the proficiency bonus progression and any bonuses granted by other abilities match it. I chose to split athletics into climbing and swimming as a nod to the traditional thief, who's great at climbing but whom I don't see as great at other athletic activities. The uses of arcana and religion to detect magic or cosmic influence are house rules I've used for years in LL. They seemed to fit these skills perfectly. I've chosen a list without any "social" skills. You could add them back in, if you like. The exact list doesn't really matter that much. As a companion to the shorthand backgrounds PDF which I posted the other day, I've done the same thing for the races in the PHB. I was actually very surprised that all the info could be fit onto a single page! 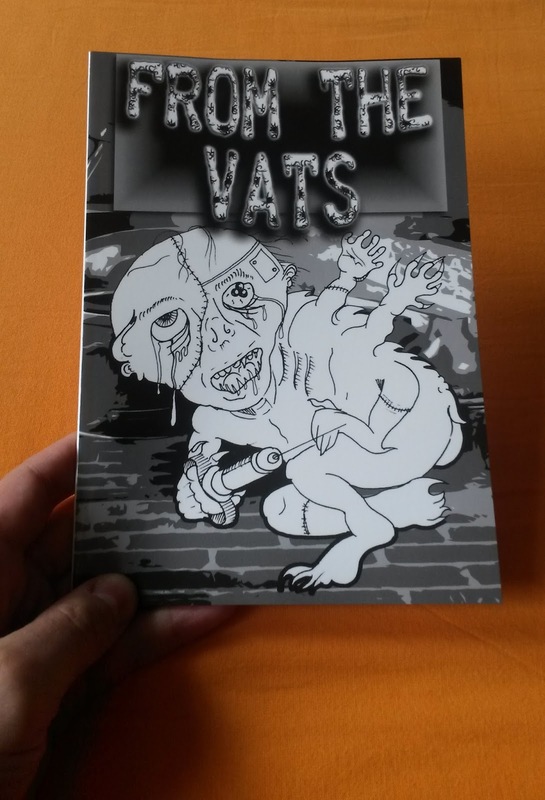 From the Vats: Print-On-Demand, All Systems Go! Yes! 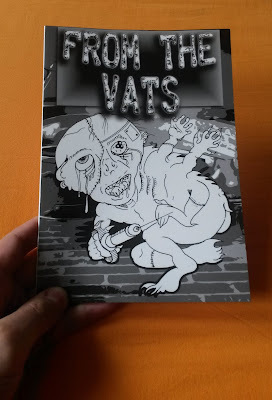 I hold within my hands the proof copy of From the Vats. All looks good, so, without further ado: go get it! Selling at-cost, currently for $3.04. I love the concept of backgrounds in D&D 5 but find their verbosity a bit overwhelming, both in terms of the amount of information to read and the number of decisions that are required, what with all the lists of flaws, bonds, etc. I'm sure those add a lot to a character, in the right campaign, but I tend to prefer presentations with simple basic rule summaries and extra details elsewhere, for use if desired. So, I just got the urge to make a summarizing table of all the backgrounds in the PHB. I've wanted to try this for a long time as I've always felt that they could be expressed (in their most basic form) as a table on a single page. So, here you go, as a PDF. Seeing them presented like this also encourages me to invent some more backgrounds of my own! You devote your career to the volatile magic of the raw cardinal elements (air, earth, fire, and water), unravelling the secrets of the composition of the natural world and gaining power over planar beings made of pure elemental matter. Unlike the traditional schools of magic (described in the PHB), the school of elementalism studies magic of many different kinds, unified by the characteristics of the effect produced, rather than the magical means of operation. Some elementalists become planar explorers, drawn towards the mysteries of the elemental planes and beyond. Others, who choose to remain on their home world in the prime plane, are valued (or feared) for their power over the forces of nature, becoming wardens, fearsome war-wizards, or explorers in harsh regions of the world. Beginning when you select this school at 2nd level, the gold and time you must spend to copy an elemental spell (see list below) into your spellbook is halved. Starting at 2nd level when you choose this school, you gain the ability to transmute small quantities of pure elemental matter. For each 10 minutes you spend on the procedure, you can transmute 1 cubic foot of matter from one pure element -- air, fire, earth, or water -- to another. The transmutation is permanent. Beginning at 6th level, when you cast a spell (such as counterspell or dispel magic) to nullify elemental magic, you weave the essence of the opposite element into the spell, increasing the effectiveness of the cancellation. You add your proficiency bonus to any ability checks required to cast the spell. The creature's hit point maximum is increased by an amount equal to your wizard level. If you lose control of the elemental, you may make a DC 15 Charisma save. If the save succeeds, instead of running amok, the elemental returns to its plane of origin. Starting at 14th level, after a long rest, you are able to infuse your physical form with elemental force. You must choose which of the four cardinal elements to bond with, gaining advantage on saving throws against and resistance to damage from that element (spells, for example, or the attacks of elementals). This deep integration with an element also makes you vulnerable to damage from the opposite element (fire and water are opposed, air and earth are opposed) -- if you suffer damage from the opposed element, the damage increases by one point per die rolled. When in this state of elemental fusion, your physical form bears obvious marks of the transformation. You may be surrounded with clouds of smoke, dust, or steam; your hair may blow wildly as if in a storm; your eyes may flicker with lightning or glow like magma; or your skin may become charred, brine-encrusted, or studded with crystals. After a long rest, you may choose to return your body to its natural state -- an equal balance of the four elements. Spells in italics are described in the Elemental Evil Players Companion. Some reworkings of old Labyrinth Lord material for D&D 5. Certain psychoactive substances favoured by adventurers have a highly addictive nature. Each time you consume such a compound, you must make a WIS save in order to resist increasing dependency. The difficulty of the save depends on the compound. There are three levels of addiction, each with more severe side-effects than the last. When you fail a save against addiction, your addiction level for that drug increases one step. After the dose wears off, for the next week, you must make another addiction save whenever an opportunity to purchase and use the drug presents itself. Failure indicates that you are unable to resist. You must use the drug once a week or suffer disadvantage on DEX and WIS checks. You must use the drug once per day or suffer disadvantage on all ability checks and attack rolls. Duration: Until next long rest. Appearance: Scintillating, rainbow-hued dust of the finest grain. Effects: You can prepare one additional wizard spell. Additionally, once during the period of the drug's effect, after casting a wizard spell you may spend an action to attempt to retain the expended spell slot. This requires an INT save (difficulty 10 + the level of the slot). If you fail, you are stunned until your next turn. Appearance: Gritty, crystalline powder of alchemical manufacture. Effects: +2 DEX, +2 INT. Additional +1 bonus to initiative. Side-effects: -1 CON until you rest for a full week. I've recently been contemplating getting a slightly revised edition of my free book Theorems & Thaumaturgy together. The original impetus for this idea was that I realised that the book's still not available in print on RPGNow -- just at lulu. Include guide to integrating specialist wizards in campaigns (see here). Also mention the idea of running a campaign purely based around one or two alternative types of wizard, completely replacing the standard magic-user. Consider adding a few more fey elf spells. Add some more descriptive information on the tomes. Add a few more magic items? Remove monsters not related to summoning spells. If anyone has any thoughts on this, I'd be very interested to hear them!